Taliban have refused to continue with peace talks if US forces continue being stationed in Afghanistan. A few days ago, they cancelled talks with Zalmay Khalilzad for prospective peace over differences in agenda. A person drawing mixed feelings from Afghanistan and Pakistan, a country with high stakes in peace for Afghanistan-Khalilzad’s appointment as President Trump’s special adviser to Afghanistan drew a lot of ire from a cross section of people from both sides of the border. In 2017, giving an interview to CNN, he spoke about increasing the number of US troops fighting in Afghanistan up to 5000, besides developing an all-encompassing strategy to address the internal issues of Afghanistan. The core issue Afghanistan has is the absence of a legitimate government that brings in the reforms that Afghanistan needs. They hate the puppet government installed by the US. Forcing stakeholders on table with different interests altogether from within Afghanistan will simply not work. This has been and will continue to be viewed as an American agenda. Not as a genuine desire for peace. Let the legitimately elected leaders deal with the reforms and the best governance procedures themselves instead on being imposed on them. That, as we see, has never worked. The people of Afghanistan must trust their government that we fail to see happening now. There is a fear that if US withdraws from Afghanistan without implementing peace(that they failed doing all these years) and bringing reforms to strengthen institutions (that they failed to do all these years) war will break out. Well, has the war stopped all these years that U.S and NATO had their boots on ground in Afghanistan? If they fight amongst themselves, they will ultimately seek a solution amongst themselves too. That will eventually lead to a long lasting solution. However, if U.S actually fears not the aftermath but rather the stepping up of presence by their non-allies, like Russia, Iran and others, they seriously need to work on a strategy to handle that situation rather than dragging their feet in Afghanistan that achieves no result and n0-face saving. Sometimes a lot of experience in a certain area of work does not actually lead to a solution. It can lead to trapping the individual in a box, stopping him from seeking effective out-of-box solutions. Mr Zalmay Khalilzad will probably not be able to deliver on this one. The writer is a lawyer, academic and political analyst. 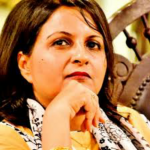 She has authored a book titled ‘A Comparative Analysis of Media & Media Laws in Pakistan.’ She can be contacted at: yasmeenali62@gmail.com and tweets at @yasmeen_9.